Your wedding rings, a symbol of your union, love and commitment, make a statement. When you choose a hand-crafted ring from Ritani, they say you have found the man or woman of your dreams, and you know them. The bridal designer creates rings that you will cherish and be happy to wear from your wedding day forward! 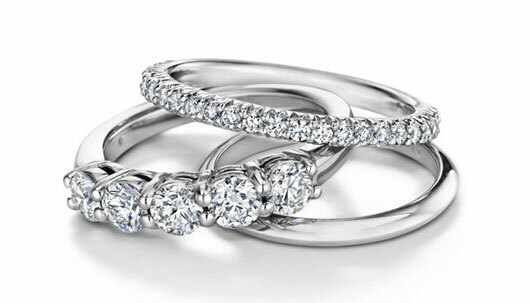 There are Ritani wedding ring styles for men and women. Women’s styles range from diamond to eternity, stacking and plain rings. You will find bands crafted in platinum, 18K white, yellow or rose gold, 14K white gold and palladium. Men’s wedding bands have various edges and fits. Edges are rounded or knife-edged. The easy-to-wear comfort fit has a slightly rounded inner edge. Finishes are smooth and shiny, hammered or satin. Whether you are rustic or classic, there is a Ritani ring with your name on it! Bands of 18K white and yellow gold, 14K white gold, palladium, platinum and cobalt chrome are available. Find his and her Ritani wedding band with or without diamonds, in styles that complement each other or match.